Whilst our minds tend to gravitate to skirts and dresses when thinking of women’s fashion, current trends challenge what is deemed as ‘racewear.’ Classically, pants were rarely seen being worn by women on-course, however 2018 looks to be the year of the pants! 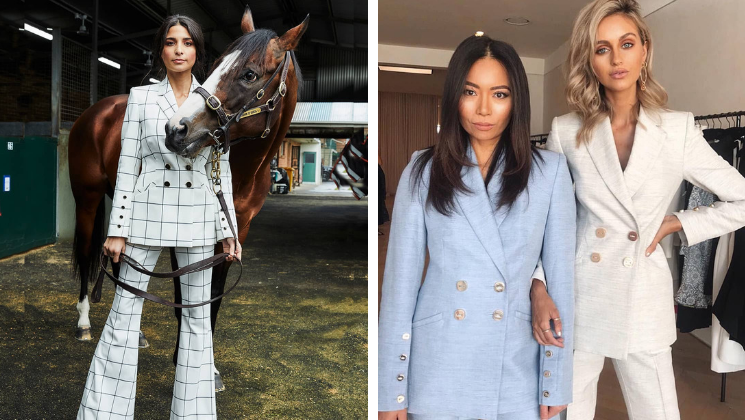 With tracks around the country looking to attract younger racegoers, there is naturally going to be a shift in raceday fashion. High dress standards remain at the forefront of racing but what is considered to be ‘racewear appropriate’ is evolving. Even Royal Ascot, an historic track riddled with tradition have given pant suits the green light! To add a feminine touch to this masculine inspired look, consider accessorising with a jeweled crown, bow or leather flower crown. Pairing pants with a high heel is essential and will reinforce femininity as well as keeping the look ‘dressy.’ Opting for a matching pant suit can be a great way to achieve a polished look. With the often unpredictable New Zealand Spring weather upon us, pants are a great option for slightly cooler days to keep your lower half warm (or when you’ve forgotten to tan!) You can also create many outfits from a good pair of pants, something that is harder to achieve with a single dress. If you are heading into a members area, we suggest you double check that your pant ensemble abides with their dress code! Try to avoid untailored pants and pants that have see-through legs. Although, these can be a great option for more more casual racedays and general admission areas. Pants at the races - too casual, too masculine? Absolutely not! We cannot wait to see what looks you’ll be rocking next time you’re on-course.